Hosted by Abergavenny Borough Youth Brass Band and funded by Ty Cerdd, we are pleased to invite young players under 18 years old from the area to a weekend master class with tutors from the world famous championship winning Tredegar Town Band. This will culminate in a Musical Extravaganza on the Sunday afternoon featuring students from the course. This event will take place on Saturday 5th and Sunday 6th November, from 10am till 4pm both days. The Sunday concert will be from 4pm till 5pm. And the whole thing, including admission to the concert, is FREE OF CHARGE! A special short course for beginners will run on the Sunday morning only, starting at 10am and finishing with a short concert from from 11.45 till 12.00. The venue is Victoria Primary School, Lower Harpers Road, Abersychan, NP4 8PW. We suggest that attendees bring packed lunches and drinks on both days. Abergavenny youth band members please confirm attendance by text to Colin. The band is planning a youth master class for the weekend of November 5th and 6th. This will involve two days of expert tuition for all players in the beginners band and youth band and will also be open to players from other areas. Led by tutors from one of Britain's top championship section bands as well as our own Lana Tingay and Alun F Williams, the weekend of music making will culminate in a celebration concert for friends and family members. More information will be available when plans are finalised so watch this space. Apologies for gratuitous use of the V-word but the band needs volunteers to help run the car park for the Steam Rally on Sunday 24th and Monday 25th May. The car park is in the field by the skate park in Pen-y-pound and the job is dead simple. Someone relieves the visitor of some of their money and someone else shows them where to park. The band gets to keep all the proceeds and, if the sun shines, it's one of our biggest fund raisers. If you can spare a couple of hours on either day please let Colin know. Thank you! We have several jobs coming up in the next few weeks. Please let Colin know which ones you can and can't get to. We will be joining the senior band for this concert to celebrate the 70th anniversary of VE-Day. Our regular bank holiday afternoon gig in the park. Taking part in an evening concert at the Ballroom in Beaufort to help raise money for this great charity. All the details for our trip to Ross can be found by clicking here. For details of the venue, including a map, click here. Welcome to 2015, which is sure to be another busy year for the youth band. Tuesday rehearsals are up and running again as normal - beginner band at 5.30 and youth band at 6.00 till 7.15. We'll keep you posted about any forthcoming events. For the time being please put Sunday 26 April in your diaries for our annual visit to Ross-on-Wye for the Gloucestershire Brass Band Association entertainment contest. A big thank you to all those who took part in the Christmas concert and the Borough Theatre and helped make it such a successful event. The party the following day went equally well and for once we didn't finish up with a million left-over sausage rolls. A bit of variety in the party bags has to be a good thing! Photos of the party can be seen in the photos area of the website. Click here to go straight there. For all the details for our trip to Ross next Sunday click here. Information about the venue, including a map, is available here. Many thanks to those of you who have volunteered to take part in the Rotary Swimathon on Sunday 17 November. Please download a sponsorship form here. Remember, every pound you collect will be matched by Rotary so please encourage your sponsors to give generously! We swim at 3pm so please be there around 2.45 to get ready. To see the latest youth band newsletter please click here. It contains details of all our upcoming events including a barbeque on 23 June and our concert at the Borough Theatre on 29 June. Our next youth band engagement is on Sunday 2 June at the Church Hall, Merthyr Road, Govilon. 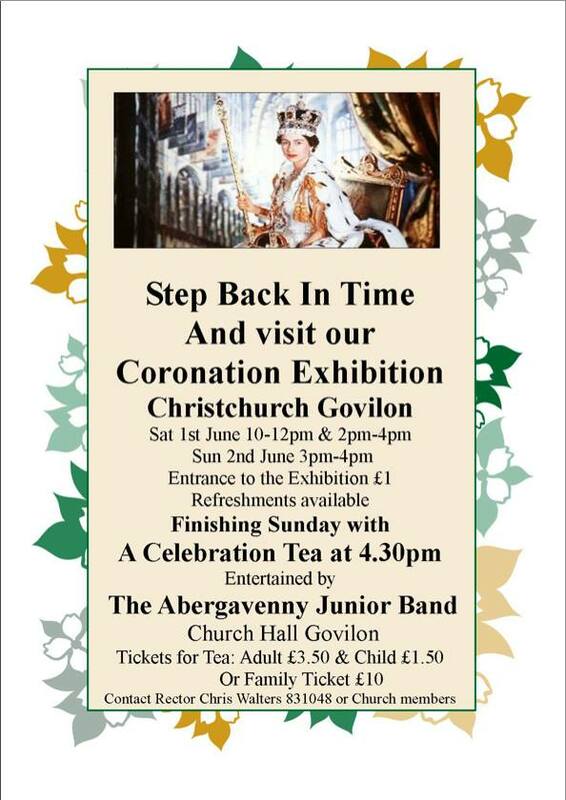 The church is holding a Coronation Exhibition on Saturday and Sunday, culminating in a celebration tea with entertainment by the band at 4.30 pm on Sunday. Please arrive between 4.00 and 4.15 to be ready to play at 4.30. Uniform as usual - white shirt and black everything else. Friends and family are welcome to attend the tea - tickets are available from Rector Chris Walters on 01873 830909 or Mary Owen on 830427. Adults £3.50, children £1.50 or £10 for a family. To see a poster for the event click here . Note that the church hall is not next to the church but is on Merthyr Road near the junction with Church Lane. The youth band is delighted to be teaming up with other local organisations for a Celebration of Youth Music on 29 June. Taking the stage with the band will be musical theatre group AAODS Juniors, Llanfoist School Choir and newly formed vocal group Côr Bach. It promises to be a great night and tickets are priced to sell fast at only £5 each. Available from Borough Theatre Box Office on 01873 850805. Sunday 26th May: Steam Rally at Bailey Park. Approx 3pm for an hour but time tbc. Sunday 2nd June: Garden Party nr Crickhowell, afternoon. Saturday 29th June: Fete at Glaslyn Court, Gilwern (afternoon) AND concert at Borough Theatre (evening). Saturday 31st August: Llanover Village Fete, afternoon. The Greater Gwent Music Service's solo and quartet competition scheduled for Saturday 1 June has unfortunately been cancelled. However, there is still a great opportunity for soloists and groups to shine at the Forest of Dean Young Musician competition on Saturday 13 July. More details here soon. A new newsletter has been published giving details of all our engagements in the run-up to Christmas. Click here to read it. Once again the Junior Band has been engaged to perform a concert at Govilon Church, Abergavenny. Always a popular event for the village, the Juniors are once again looking forward to playing to a full house and have prepared a first class programme under the guidance of tutor and conductor, Lana Tingay. The concert will be on Friday 30th November starting at 7:30pm. The band will be joined by vocalist Christine Burbridge and tickets are available from Marian Dicks on 01873 831004. The Junior Band was pleased to be invited to play at this years Environment and Community Fair held on 14th October at the towns market hall. The youngsters delighted the audience with their playing of a popular music repertoire which included several Beatles numbers. Conductor, Lana Tingay said how pleased she was with the playing and the appreciation of the audience and event organisers. The youth band stepped in at the last minute to take on a fundraising event in Abergavenny town centre on 4th August. Despite the school holidays being in full swing the band mustered more than 20 players and entertained the shoppers for two hours, raising more than £300 in the process! At that rate the senior band had better watch out - we definitely have a better hourly rate! Thanks to those adults who helped out and to Evan for conducting. 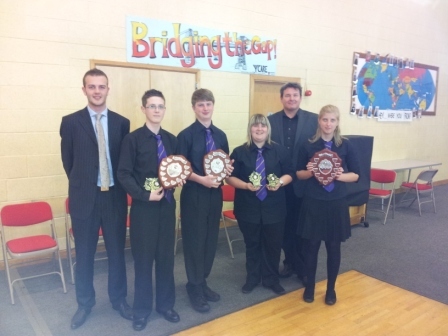 Members of the youth band brought home a pile of trophies after a very successful appearance at the 7th GMSS Solo, Quartet and Ensembles contest at Newport on Saturday 9 June. Erin Shorey was our first victor, taking first place in the 11-and-under slow melody category with a convincing performance of Maria from West Side Story. Second place went to another Abergavenny player, Megan Cooke, although on this occasion Megan was representing Pontypool Band. Gabrielle Perry also represented Abergavenny with a great rendition of Merrily we Roll Along. Evan Roberts took first place in the 14 and 15-year old air-varie class with a sprightly performance of La Belle Americaine. Anna Roberts just missed out on the prizes in the same category but her slow melody performance certainly caught the attention of Alun F Williams who invited her to join the Gwent Youth Band the following day. Well done Anna! Richard Ward and Bethan Cooke also gave fine performances in a very competitive 14 and 15-year old field. In the afternoon session the soloists yielded the floor to the quartets and larger ensembles. In the 15-and-under category our quartet Only Brass R Loud beat off a challenge from two Blaenavon groups to take first prize. They then caused something of a stir by beating bookies' favourite Croeseceiliog School to take the open class as well. Hearty congratulations to Evan, Richard, Bethan and Anna. Adjudicators Tom Hutchinson and Chris Thomas, both from the Cory Band, gave a short recital during the results session, certainly giving the young players something to aspire to and leaving many of the audience open-mouthed. There's a lot to look forward to this summer. Click here for our latest Youth Band Newsletter. The junior band will be performing a mini concert on 21 February at the Salvation Army Hall in Victoria Street, just around the corner from the band hall. The concert is mainly intended for the benefit of members' families but the doors will be open to anyone who would like to hear us. Entrance is free and the concert will feature both our beginner ensemble and the youth band. Please will players arrive between 6.00 and 6.15 so that we can get started at 6.30 prompt. We aim to be finished no later than 8.30pm. 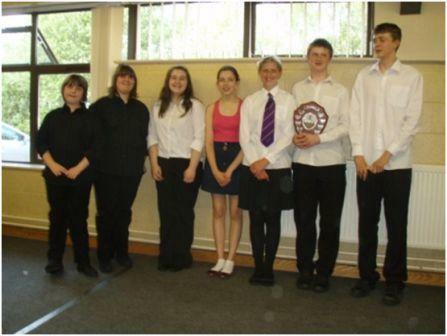 The 2012 Crosskeys festival took place on Saturday 28 January and proved to be a rewarding day for the youth band. We were proud to put 30 youngsters on the stage and, with only minimal help from senior band members, to walk away with an award for the most improved Gwent-based band. Congratulations also to Natasha Michie who received a special award as the youngest player in the Independent/Community band section! Under Lana's direction the band had prepared hard to present a programme of mainly American tunes and the performance passed off with hardly a hitch. Overall the band was placed sixth and, as such a young band competing against much more experienced outfits, we can all be pleased with our achievement. With our ranks so full the future is very promising. Well done to everyone who took part and a big thank you to all the parents who delivered their children on time to the rehearsals and the festival. Let's keep up the good work! Group and individual photos taken at the event should be available for purchase in a few weeks' time. 28th January 2012 sees the return of this popular youth brass band festival at Colleg Gwent, Cross Keys. Our juniors are now preparing their programme for participation in the event with lots of excitement and enthusiasm. The junior band has taken part in this festival over many years and we are glad to see it return to the calendar after a year away due to the rebuilding of the College Campus. 4 November was a great success! Abergavenny Eisteddfod took place on Saturday 18 June at King Henry School and proved a happy hunting ground for members of the youth band. Trombonist Bethan Cooke took solo honours, earning a very well deserved second place in the instrumental class for 11 to 14 year olds. Then, switching to baritone, Bethan joined Emily Humphries and Evan and Anna Roberts for a performance with the quartet Only Brass R Loud. Contrary to their name the ensemble showed that they can play all the dynamics during their rendition of La Mer and the crowd's favourite, Wallace and Gromit's Grand Day Out. The quartet were awarded first place and invited to take part in the evening gala concert at the Borough Theatre as one of the four best acts in the youth eisteddfod. Their performance at the theatre was complimented by many members of the audience and the additional prize money for the concert appearance was much appreciated by all four members. Evan Roberts was also successful in the jazz category, attaining second place and taking part in the gala concert. 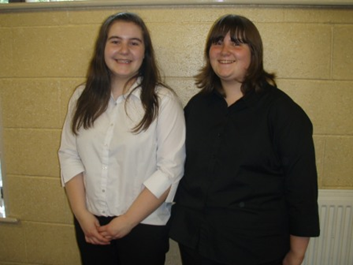 Hearty congratulations are due to two of our young ladies for their excellent performances at the Greater Gwent Solos and Quartets contest held in Newport on 4 June. Emily Humphries gained second place in a hard-fought 15-and-under air varie section while Bethan Cooke also took second place in an equally tough slow melody contest for 12 and 13-year-olds. In what turned out to be a great day for Emily she also picked up third place in the slow melody class for 14 and 15-year-olds and the open air-varie class. What a great haul! Members of our youth band also excelled in the quartets and ensembles section, the 15-and-under ensemble Brass Monkeys walking away with first prize in their section. Our quartet Only Brass R Loud also put in solid performances to take second and third places in the 15-and-under and open categories respectively. Well done to all Abergavenny participants who played in solos and in groups. The band was well represented throughout the competition and we are delighted that so many of our young players took part. As of 11 January 2011 there will no longer be a specific session for the new beginners who joined us in the autumn term. The beginners have progressed very well indeed and will be amalgamated into the junior band session on Tuesdays from 6.00 to 7.15 pm. The junior section has got the new school year off to a flying start by welcoming a host of new members to its ranks. A new class has been started at 5.30 on Tuesdays especially to accommodate the influx of beginners. This week's session was attended by 18 players and more are expected in the next couple of weeks. Thanks are due to Owen Farr, local peripatetic brass tutor with Gwent Music Support Service, for directing his new students to the band. As well as the beginner class, the junior section runs an intermediate session at 6pm on Tuesdays and the youth band at 6pm on Thursdays. New members are always welcome at all levels. Following the resounding success of the Junior Bands concert at St Mary's Priory, Abergavenny on July 16th when the Soroptomists orgaised a Hog Roast in aid of the Band, some £700 was raised to support the Juniors. This was a marvelous occasion organised by the Abergavenny Soroptomists and we all appreciate the support they have given the Juniors. Darryth Jenkins, Soroptomist President, started to organise a fundraiser for the band over a year ago when she met Band Chairman, Andrew Richards, at the Mayor of Abergavenny's dinner. The Junior Band is really grateful for the opportunity to give a concert for such an important local organisation and we thank all involved for what was a very enjoyable and successful event. Well done all in the Junior Band for an excellent performance. Congratulations to Abergavenny's Emily Humphries and Evan Roberts who have both just completed the annual five-day course with the National Children's Brass Band of Great Britain (NCBBGB). This year's course was held at Repton School near Burton Upon Trent and culminated in a concert on Saturday afternoon at Nottingham's Albert Hall. Both players were rewarded with places on the front row, having impressed cornet superstar and course tutor Richard Marshall during their seating place auditions. The band was directed by Black Dyke MD Nick Childs, assisted by a stellar team of tutors including Owen Farr, Brett Baker, Paul Lovatt Cooper and Abergavenny old-boy Matthew Routley. Parents of all our junior members are invited to attend the band's annual dinner at the King of Prussia on Saturday 11 September at 7.00pm. Several have already signed up but the more the merrier! Please click here to see the menu and text your choices to Colin on 07920 495800 no later than Tuesday 3 August. The cost is £17 per head, payable in advance. The Junior Bands busy concert schedule culminated last night (16th July) with a performance at the Priory Room, St Marys Church, Abergavenny. Performing ensemble pieces and several solo items the band provided Abergavenny Soroptomists with an excellent concert which received a well deserved standing ovation. The concert was the jewel in the crown of several engagements over the spring and summer starting with the Gwent Ensemble, Quartet and Solo Competition in Newport, a concert at Llanfihangel Crucorney, Pandy Show and School Fete. Lana Tingay, Junior Band Tutor, said “The children are amazing. They have worked extremely hard preparing for these engagements and have performed to a very high standard. All of us in the Band are very proud of their achievements and look forward to doing more concerts in the future”. On 10th June 2010 we were pleased to welcome Gwent Music Support Service (GMSS) to the Band Room during a junior Band rehearsal. Click here for a report on the visit. 16th July: Concert, St Mary's Priory. Abergavenny Soroptomists Hog Roast in aid of the Junior Band.